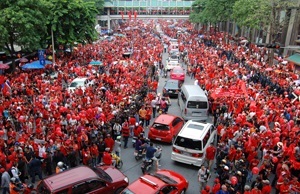 A mass demonstration in Bangkok, Thailand, organized by the Red Shirts (UDD) at the Ratchaprasong intersection, April 8, 2010; the protest lasted for over 6 weeks and ended violently. It is a self-evident fact that around the world, the relationship between citizens and the institutions that affect their lives is experiencing a growing crisis of legitimacy. In neglected rural and outlying areas where government institutions are weak, corrupt, or non-existent, citizens have turned to non-state actors for social services. This has been dramatically the case of the population living in the otherwise-governed territories of northern Mali. In many established and emerging democracies, citizen participation in conventional electoral politics is in steady decline, and public trust in elected elites is eroding. In some contexts, this disillusionment with government and organized politics by some demographics and support by other demographics have resulted in polarization and exacerbated social divisions. In many countries, disenchanted citizens have grown less deferential to authority and have resorted to various ways of voicing their grievances, not all of them peaceful. This year alone has been one of vibrant and daring social protests, most recently with the tumult in Ukraine and Thailand. Disturbances have also taken place even in ultra-stable Singapore. Protests have also rumbled on intermittently in several austerity-afflicted European countries, and last summer, reports of mass demonstrations in Turkey and Brazil filled the media. And as it has been repeatedly observed by many analysts, this disconnect and its manifestations are also generational, since many of the protests are fueled by marginalized and fearless youth whose social media savviness has enabled them to enlarge the spaces for public policy debate and contestation beyond the streets and deliberative bodies, ill or well elected. It has been argued that the street protests are challenging, rather than reinforcing, democratic governance, at times luring citizens away from compromise and careful deliberation to instinctive and maximalist claims, sometimes fueled by unscrupulous politics. Governments, for their part, frequently respond in ways that seem incomprehensible to their citizens. In the Middle East and North Africa in particular, we have witnessed growing repression of social movements and civil society, a shrinking of democratic spaces, and the criminalization of legitimate political dissent. In some countries, the rise of fundamentalist ideas has been accompanied by increased violations of women’s human rights and the rights of minorities. One of the lessons learned over the last several years is that the path from protest to deeper democracy is at best a tortuous one. The blood bath in Syria and the violence engulfing Libya are poignant reminders of what can go wrong after initially peaceful citizen uprisings. Another lesson is that almost all protests have failed to create new political parties or other permanent structures that can channel grievances in a constructive manner and bring about the desired changes. India’s anti-corruption Common Man party is a rare exception. Many have argued that one of the main reasons for the decline in civil societies’ transformative potential is precisely the absence of credible structures that mediate between citizens and the state and between people of different views, creeds, and backgrounds. If they have ever existed, these structures have been co-opted, discredited, or have disappeared. What helped Tunisia pull back from the brink late last year was the robust intervention by credible mass membership organizations such as the national labor union (UGTT), the employers union (UTICA), the Tunisian League for the Defense of Human Rights, and the Lawyers Federation, which came to be known collectively as the Quartet. These civil society organizations capitalizing on their historical and popular legitimacy have brokered—after intense national dialogue rounds and power mediation—a road map signed by all the major political stakeholders. This road map has paved the way for the adoption of a new constitution, the designation of non-partisan, technocrat, transitional government and the consensual adoption of the electoral law. These achievements by these national structures have often been cited as an example of successful insider partial mediation. In both South and North parts of the globe, there seems to be a growing consensus that the way to bridge the gap between the state and the citizen is to create institutions and safe spaces for citizen participation while at the same time ensuring more responsive and accountable states. One area of innovation has been to extend the traditional places for citizen engagement beyond the episodic use of the ballot box (dubbed by some as “ballotocracy”) or the rubber-stamping of pre-conceived agendas and programs. In fragile and conflict-affected countries, efforts have been made to revive and strengthen traditional infrastructures for peace and consultation, as well as mediation and dialogue platforms. Kenya, after the 2007 violent elections, is a prime example of such initiatives. In a number of countries, enabling national policies have also created a new imperative to consult and engage citizens. In the Tunisian constitution adopted in January 26, 2014, participatory and inclusive governance has been enshrined in its preamble and one of its articles. A practical manifestation of this development can be seen in the opening up of public expenditure budgeting, urban planning, and other policies to citizen engagement. This has been the case in several municipalities in Bolivia, Brazil, Mongolia, and Niger, and gradually in Tunisia. At the heart of the new consensus is the need to promote more people-centered governance processes that can enhance responsibility as well as responsiveness on all sides which, one might argue, is what a resilient social covenant is designed to foster. But as is well known, in many societies these social contracts are in disrepair, and desperately need a reboot. So do citizen-citizen relations. Both the vertical and horizontal dimensions of resiliency and social cohesion need to be strengthened, if we ever hope to influence the trajectories of this global citizen movement and its uncertain outcomes.